This kit developed for protein deglycosylation includes our DeGlycoMx, a premixed cocktail of the enzymes required to remove all N-linked oligosaccharides and most O-linked sugars from 0.5 mg of glycoprotein, via 10 reactions of up to 50 micrograms of protein per reaction. The kit is easy-to-use and effective: add 2 µl of the DeGlycoMx enzyme to your denatured sample and the included buffer and incubate for 3 hours at 37˚C. The enzymes are premixed in either one 20 or 100 microliter vial. This allows researchers to quickly remove most all glycans (with the exception of O-Linked mucins) from their glycoprotein in both denatured and native conditions. By combining the enzymes into one easy-to-use premixed solution, researchers save time and money in the pursuit of protein deglycosylation. The enzymes can also be supplied individually in 20 microliter vials of each enzyme (KE-DG01) allowing the researcher to the flexibility to characterize the glycans attached to their glycoprotein more fully than with our mixture of enzymes. The Enzymatic DeGlycoMx Kit will remove all N-linked oligosaccharides and many O-linked oligosaccharides from glycoproteins. 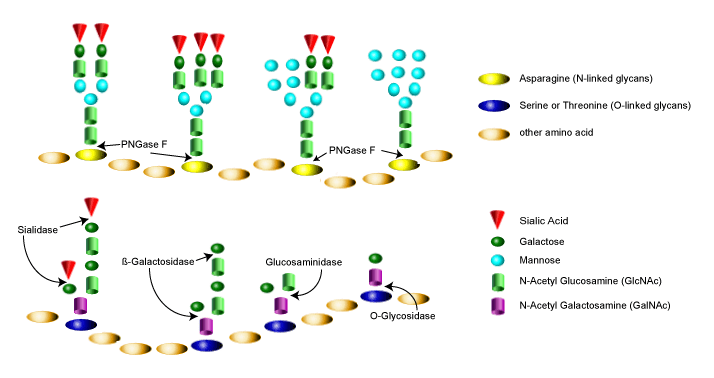 Protein deglycosylation for N-linked glycans (Asparganine-linked) is performed using the enzyme PNGase F. In addition, all Serine or Threonine linked (O-linked) Gal-(b1-3)-GalNAc-(a1) and all sialic acid substituted Gal-(b1-3)-GalNAc-(a1) will be removed using the combination of Sialidase and O-Glycosidase. The addition of Beta-Galactosidase and Glucosaminidase will assist in the deglycosylation of larger O-link structures. 1. Mix 10 µl of reaction buffer with up to 50 µg of glycoprotein in 33 µl distilled water in a 1.5 µl tube. 2. Add 2.5 µl denaturation solution. Mix gently and place in boiling water bath for 5 minutes. Chill on ice. 3. Add 2.5 µl of Triton-X. 4. Add 2 µls of the DeGlycoMx enzyme cocktail. Incubate for 3 hours at 37˚C. Note: Denaturation increases the rate of enzyme digestion up to 10 fold. If denaturation is not desired omit step 2-3, add with 5 µl of distilled water and increase incubation time up to 24 hours.